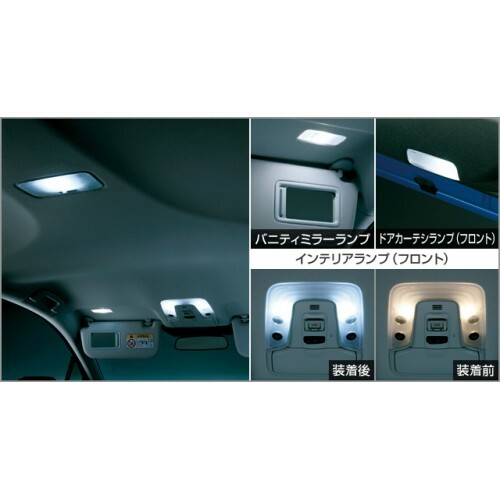 Interior lamp (front · two), interior lamp (rear · one piece), vanity mirror lamp (2 pieces), door courtesy lamp (front · 2 pieces) can be replaced with LED set. The white LED makes the room brighter and clearer. * The color and illuminance of the photograph are different from the actual. 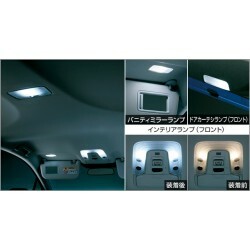 * When comparing two or more of this product, colors may look slightly different due to individual differences in LEDs. * When the engine starts or when the voltage is not stable, light may appear to flicker, but it is not a product abnormality.